A vibrant burst of roses, tulips and lilies form a fascinating bouquet of classiness and eternal elegance. 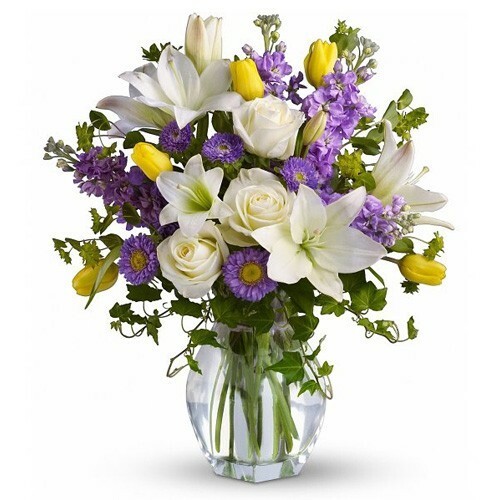 Cream roses, yellow tulips and white Asiatic lilies are brought together to create a surprising flower bouquet set to capture their every attention. Presented in a clear glass vase, this flower bouquet is a gorgeous way to extend your birthday wishes, or your greetings on Mother's Day. Quantities Serene cream roses, yellow tulips, white asiatic lilies, lavender stock and matsumoto asters in a lovely clear glass vase.